I am looking to collect some images of brothels from the USA on this page. When entering a search on Flickr a lot of images pop up. Most of them are outside images. There are also some vintage images of Navada prostitutes in revealing poses as well as tokens and coins for visits to cathouses from times when money wasn't worth too much. Obviously, truckers appear to be a target group of Nevada brothels like "Angel Ledies" as much as gamblers from nearby Las Vegas casinos. 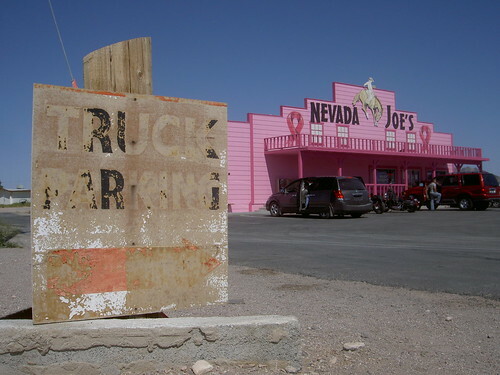 Nevada Joes presents it's house of prostitutes in pink colors. A view into Mustang Ranch. 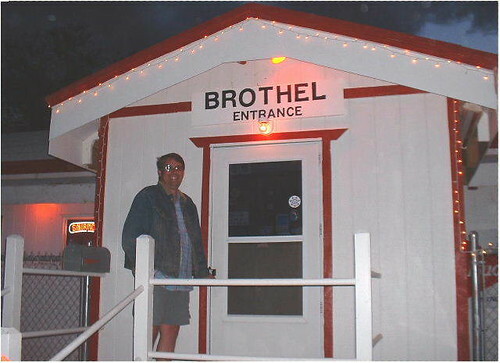 Compared to brothels in Europe or Asia, this looks like pretty cheap interieur. Reno cathouse Mustang Ranch entrance. If you care to visit one of the ranches in Nevada see out NV brothel list. Be advised they are difficult to reach and very expensive compared to whore houses in other parts of the world.